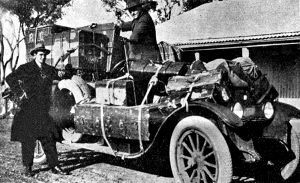 These two striking photographs were forwarded to us by the Howard Motor Company, Ltd., Brisbane. 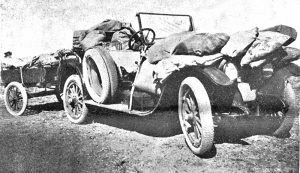 The first one is Wilkinson Bros.’ 1919 model six-cylinder Buick, which carries his Majesty’s mail between Winton and Longreach. Big loads are the rule with this car, and even the trailer has to bear its share. Neither the mail officials nor the owner have any complaint against the Buick, which in sunshine and rain performs its task with consistent ease. The car is exceptionally light on tyres, and does as much as 6000 miles on the back tyres-Dunlop Railroads. The second picture is of a 1919 Buick belonging to Wilkinson Bros. It runs regularly between Longreach and Winton, and is here shown shifting the “props” of the O’Donnell-Rae Panto Company. In addition to this cargo, the car carried three passengers. Nevertheless, it covered the journey in six hours. Both these photographs are evidence of what cars are called upon to do in the western parts of Queensland, and the fact that Wilkinson Bros. and the majority of the country hire men select the six-cylinder Buick for this class of work demonstrates unmistakably the reputation that Buick cars have established in standing up under rough conditions.